Looking to the West (1860-1900). N.A. 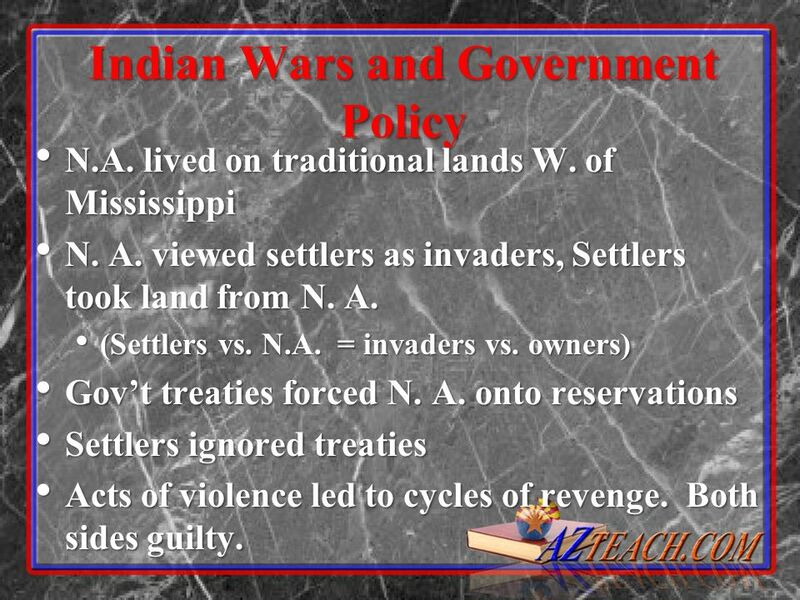 lived on traditional lands W. of Mississippi N. A. viewed settlers as invaders, Settlers took land from N. A. (Settlers vs. N.A. 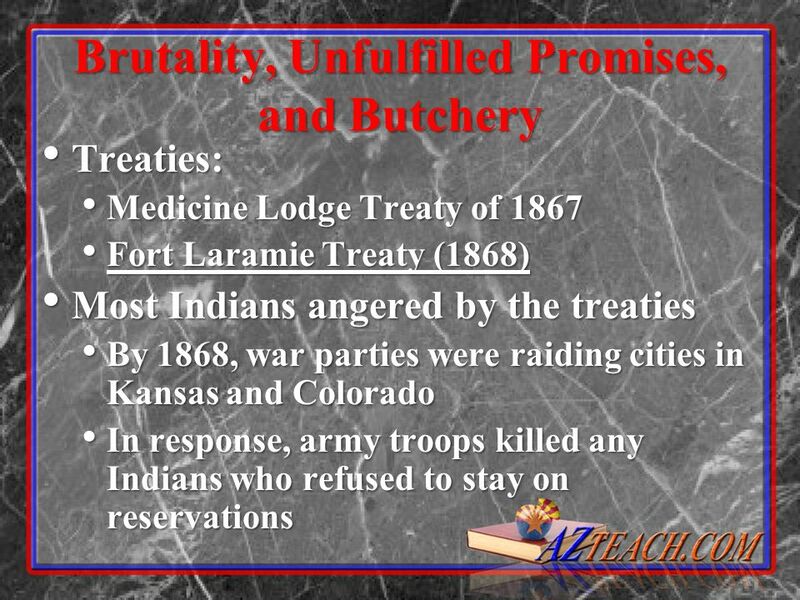 = invaders vs. owners) Gov’t treaties forced N. A. onto reservations Settlers ignored treaties Acts of violence led to cycles of revenge. Both sides guilty. 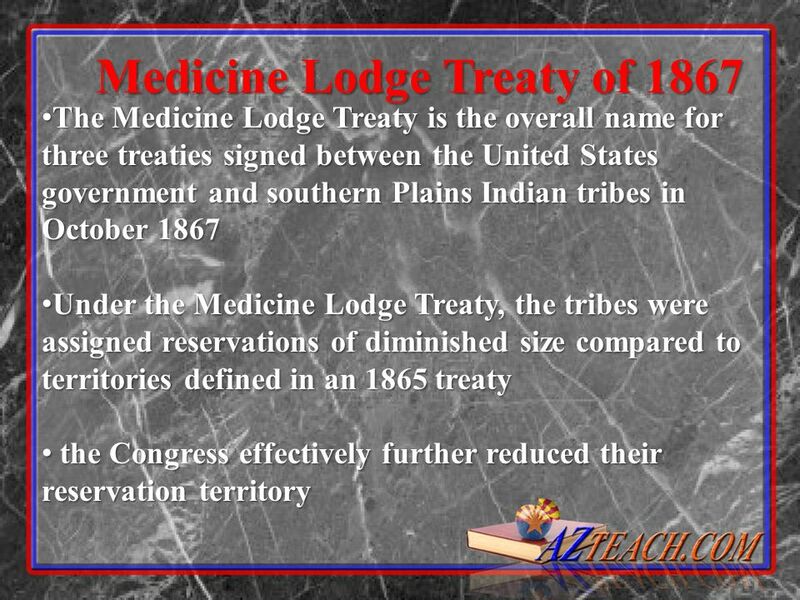 In the treaty, as part of the U.S. vendetta to "divide and conquer", the U.S. included all Ponca lands in the Great Sioux Reservation. 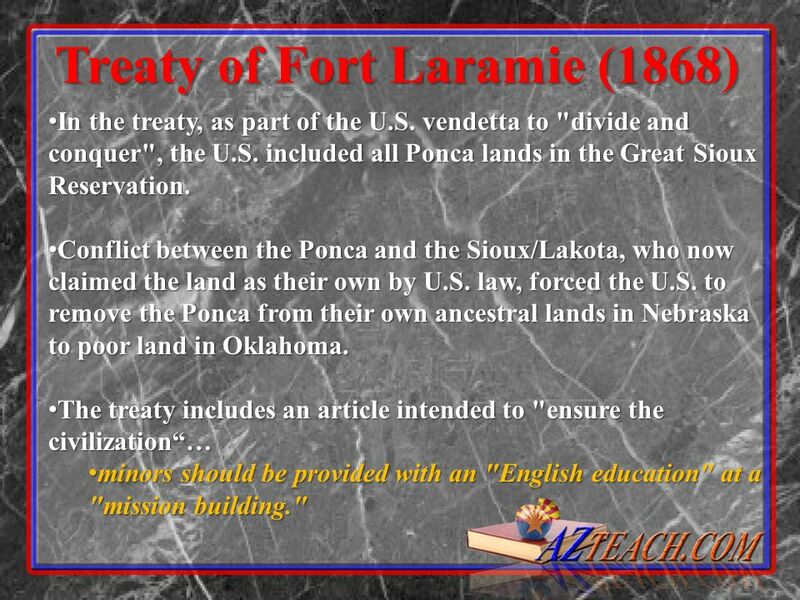 Conflict between the Ponca and the Sioux/Lakota, who now claimed the land as their own by U.S. law, forced the U.S. to remove the Ponca from their own ancestral lands in Nebraska to poor land in Oklahoma. 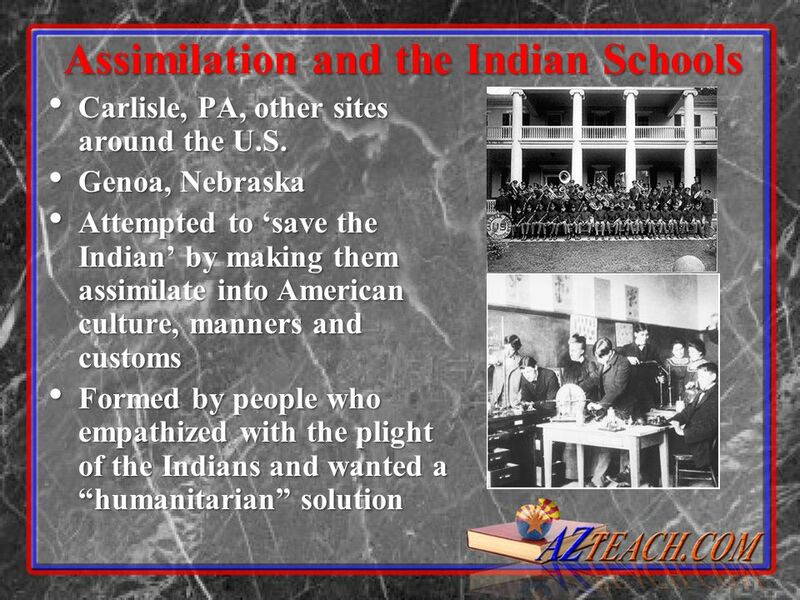 The treaty includes an article intended to "ensure the civilization“… minors should be provided with an "English education" at a "mission building." 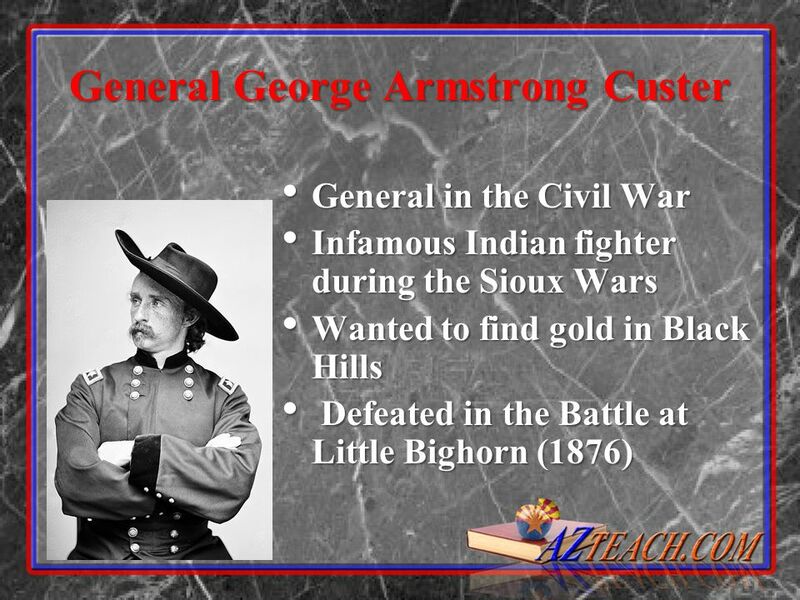 Wars/Battles Native American Nations/Homelands Key Players Description/Outcome Battle of Little Bighorn (1876) Northern plains Sioux in Dakota, Wyoming, and Montana territorries Sitting Bull Crazy Horse Red Cloud Lt. Col. George A. Custer U.S. tries to buy gold-rich Black Hills from Sioux. Talks fail. 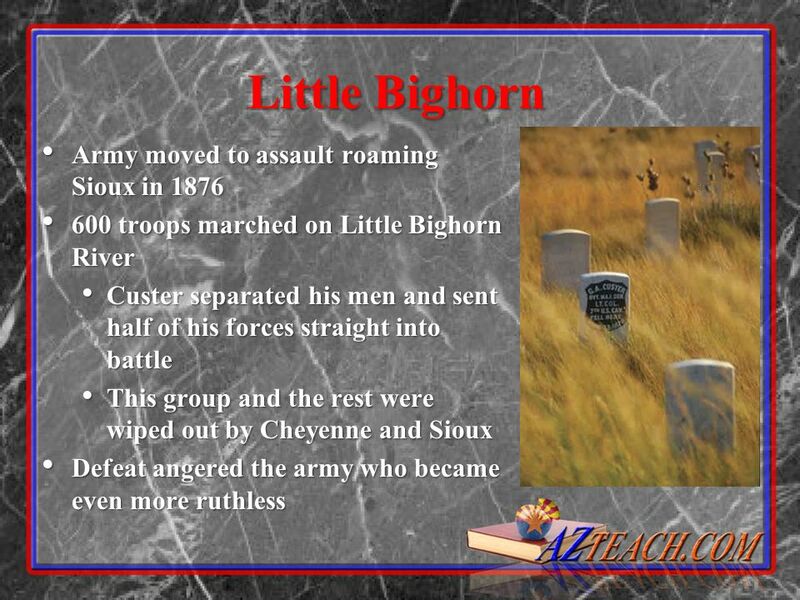 Custer’s 7th Cavalry is sent to round up Sioux, but meets huge enemy force. 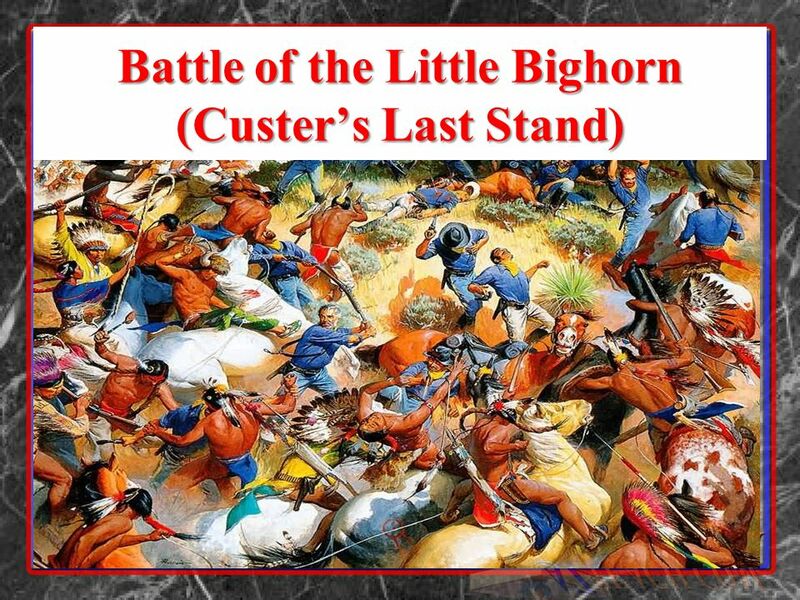 Custer and some 200 men perish in “Custer’s Last Stand.” Nez Perce War (1877) Largest branch of Nez Perce, in Wallowa Valley of Idaho and Washington territories and Oregon Chief Joseph Gen. Oliver O. Howard Col. Nelson Miles Howard orders Nez Perce to Idaho reservation; violence erupts. Joseph leads some 700 men, women, and children on 1,400-mile flight. His 200 warriors hold off Miles’s 2,000 soldiers until halted 40 miles short of Canada. 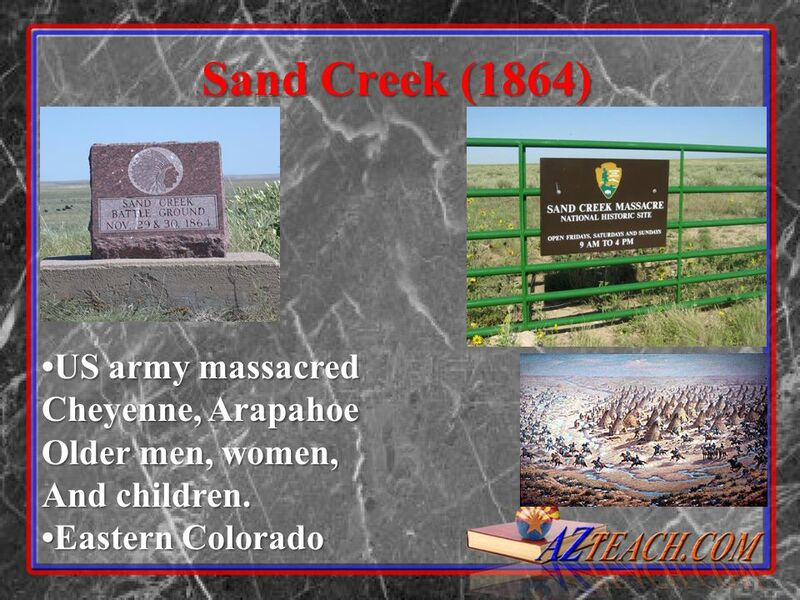 Sent to Indian Territory, many die of disease. 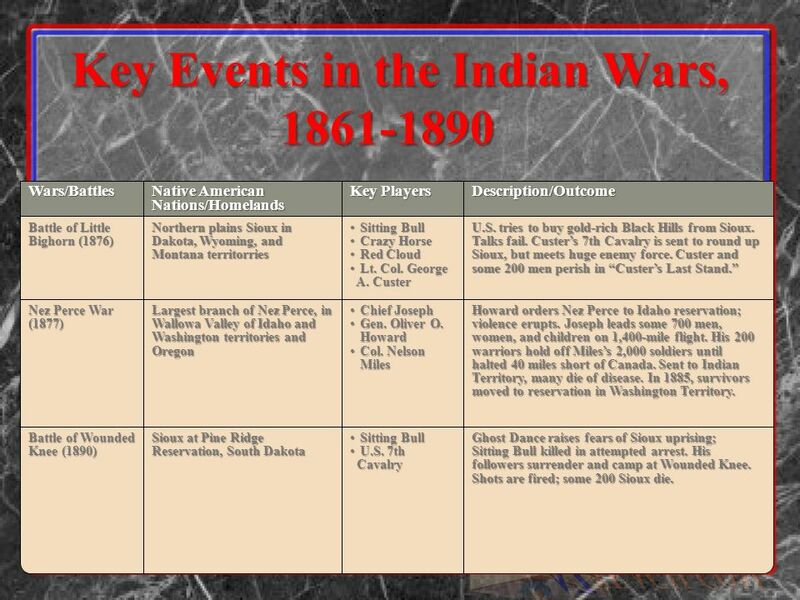 In 1885, survivors moved to reservation in Washington Territory. 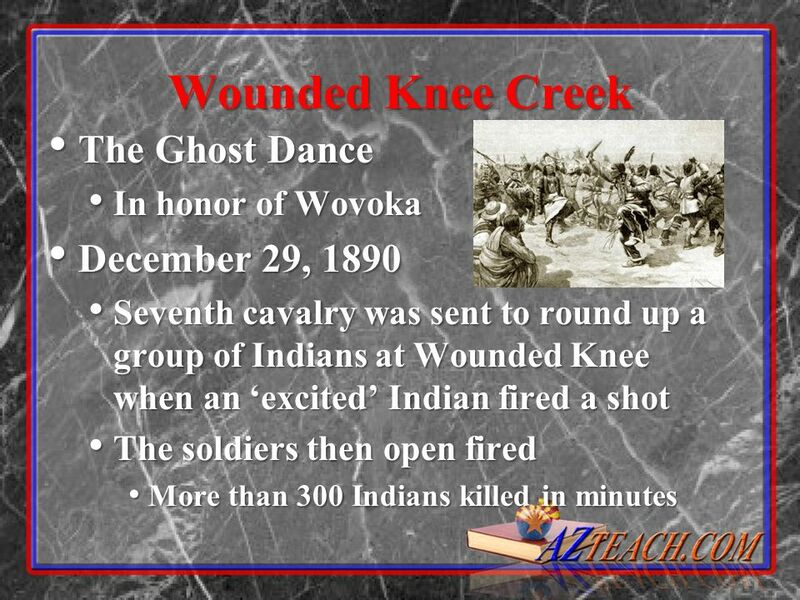 Battle of Wounded Knee (1890) Sioux at Pine Ridge Reservation, South Dakota U.S. 7th Cavalry Ghost Dance raises fears of Sioux uprising; Sitting Bull killed in attempted arrest. 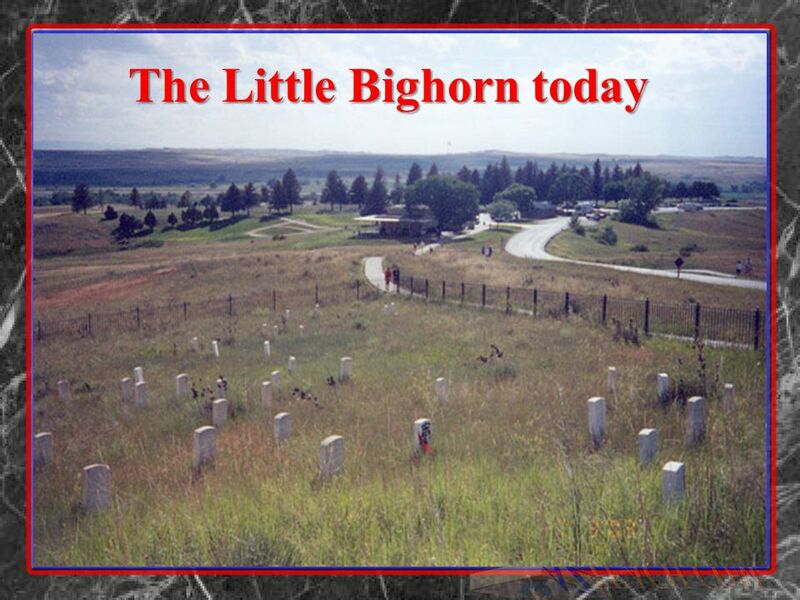 His followers surrender and camp at Wounded Knee. Shots are fired; some 200 Sioux die. 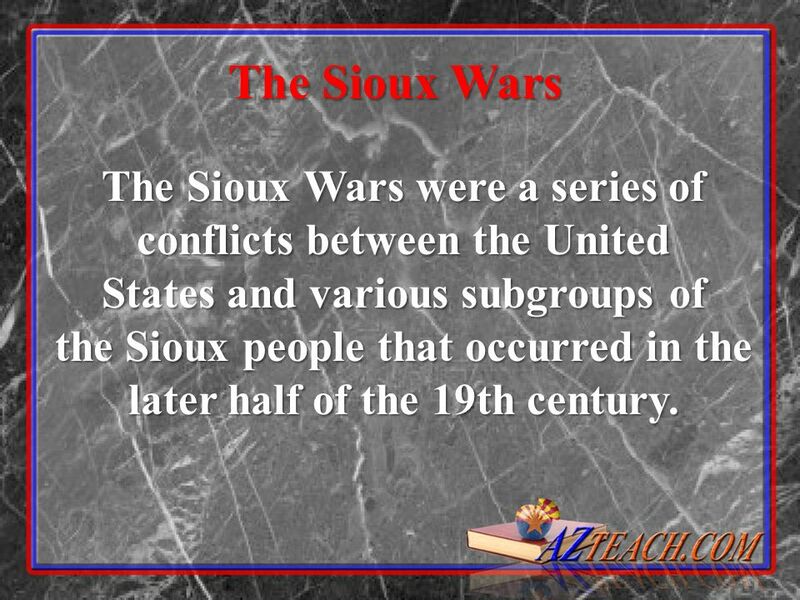 14 The Sioux Wars The Sioux Wars were a series of conflicts between the United States and various subgroups of the Sioux people that occurred in the later half of the 19th century. 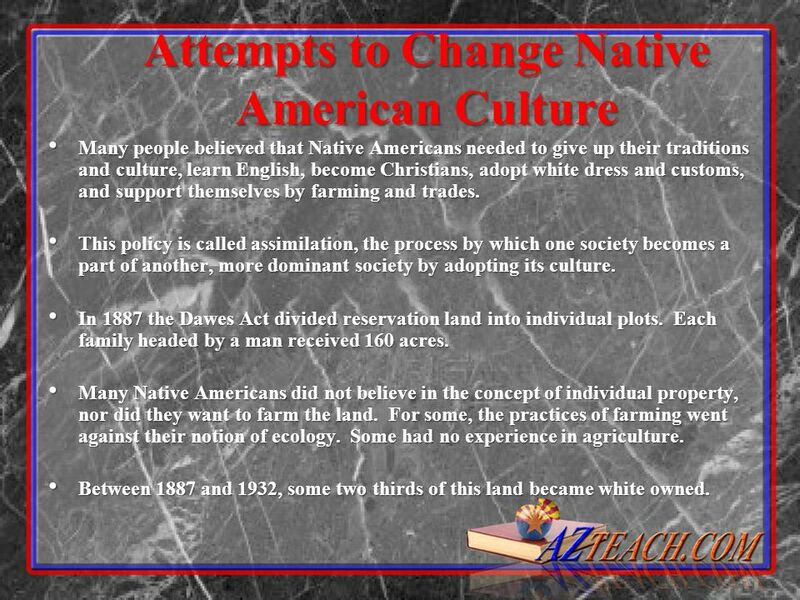 Many people believed that Native Americans needed to give up their traditions and culture, learn English, become Christians, adopt white dress and customs, and support themselves by farming and trades. This policy is called assimilation, the process by which one society becomes a part of another, more dominant society by adopting its culture. 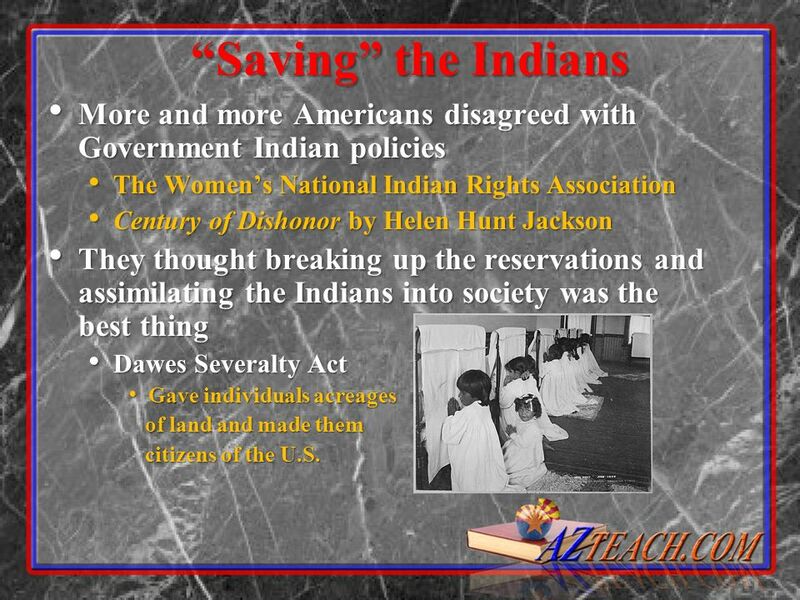 In 1887 the Dawes Act divided reservation land into individual plots. Each family headed by a man received 160 acres. 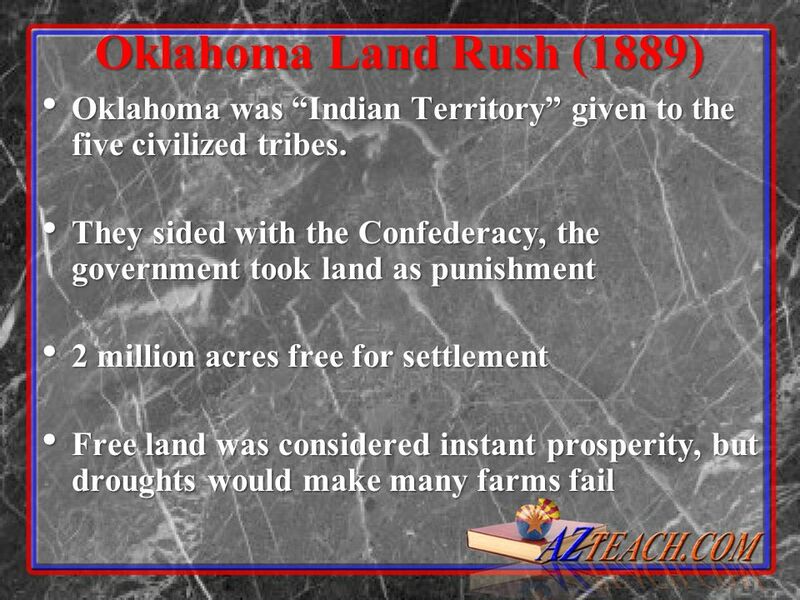 Many Native Americans did not believe in the concept of individual property, nor did they want to farm the land. For some, the practices of farming went against their notion of ecology. Some had no experience in agriculture. Between 1887 and 1932, some two thirds of this land became white owned. 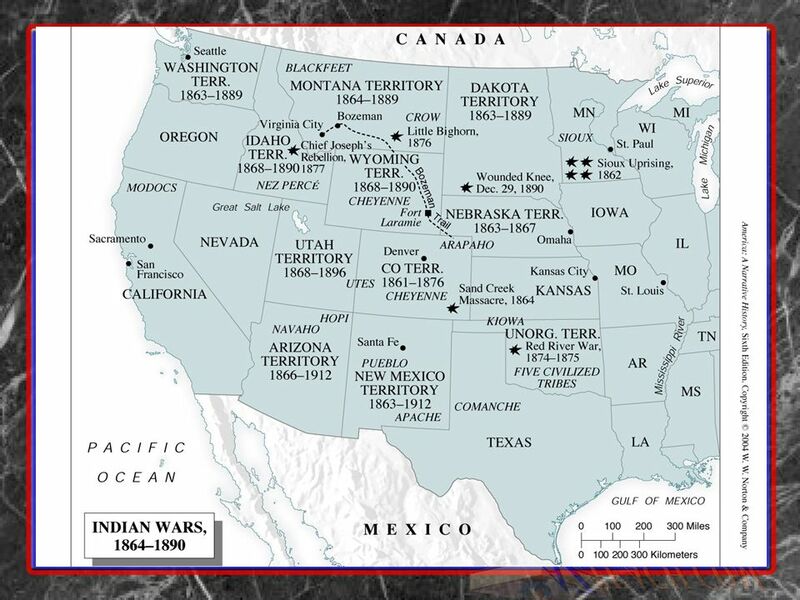 Fifty five Indian nations were forced into Indian Territory, the largest unsettled farmland in the United States. 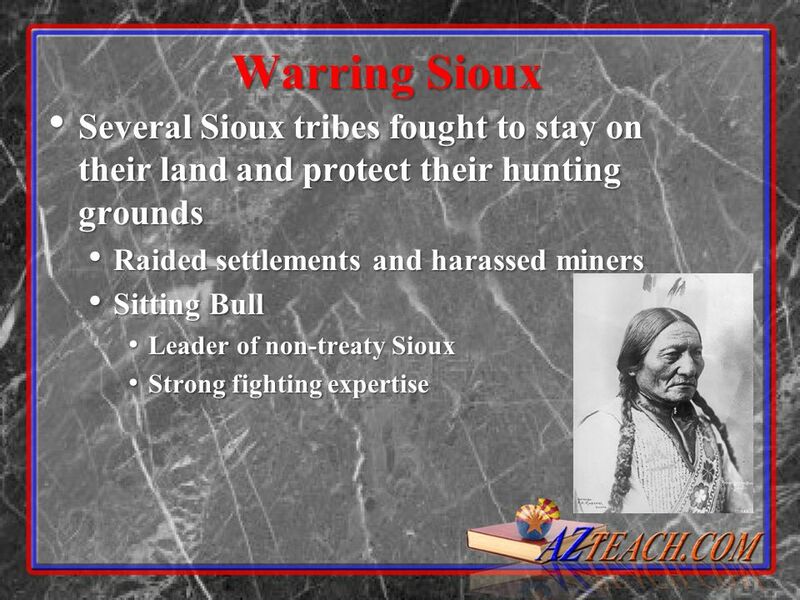 During the 1880s, squatters overran the land, and Congress agreed to buy out the Indian claims to the region. 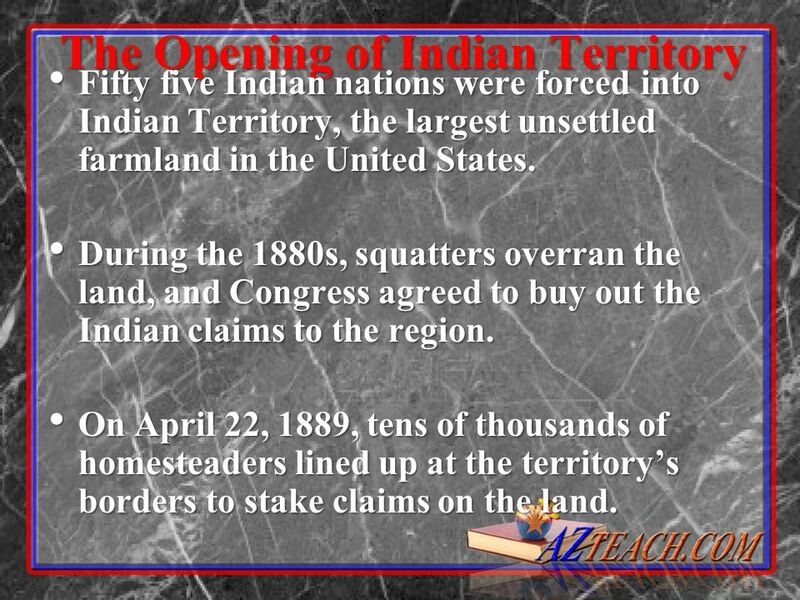 On April 22, 1889, tens of thousands of homesteaders lined up at the territory’s borders to stake claims on the land. By sundown, settlers called boomers had staked claims on almost 2 million acres. Many boomers discovered that some of the best lands had been grabbed by sooners, people who had sneaked past the government officials earlier to mark their claims. 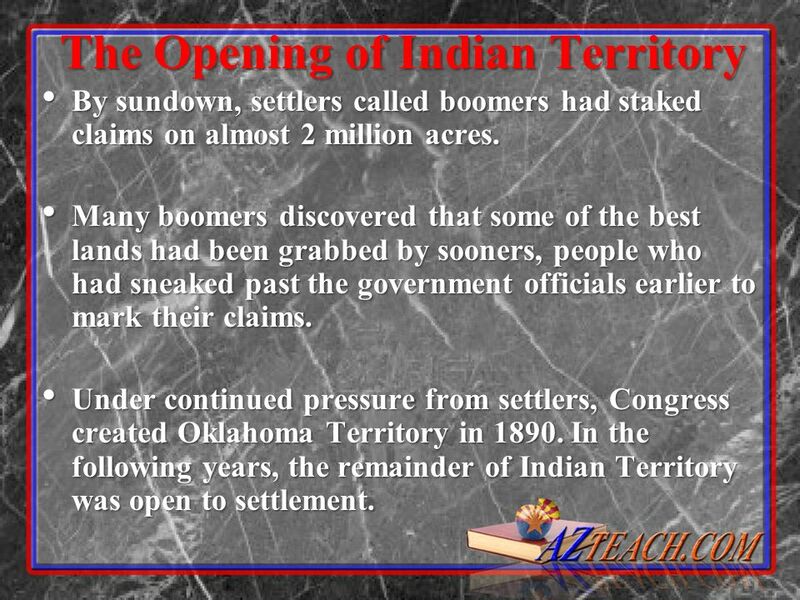 Under continued pressure from settlers, Congress created Oklahoma Territory in In the following years, the remainder of Indian Territory was open to settlement. 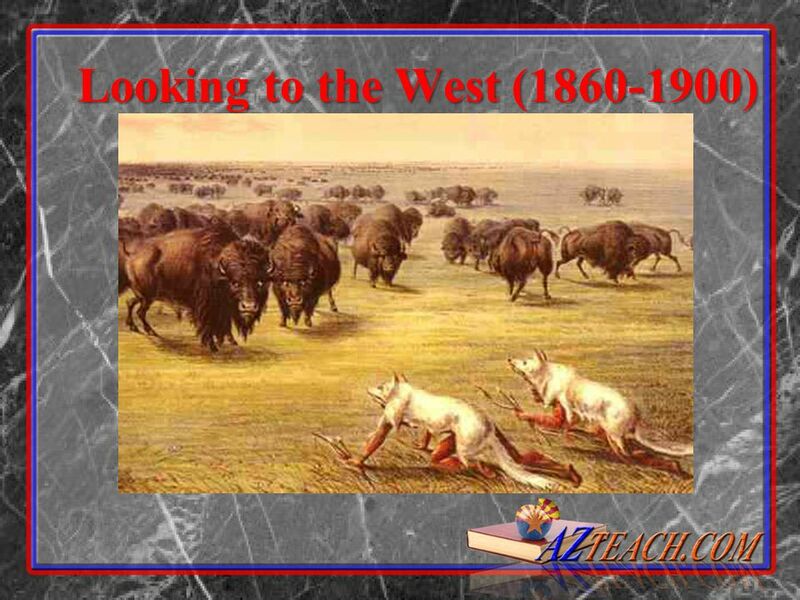 Download ppt "Looking to the West (1860-1900)." First Five Questions Name as many Native American tools/weapons, materials as you can Name as many Native American tools/weapons, materials as you can. 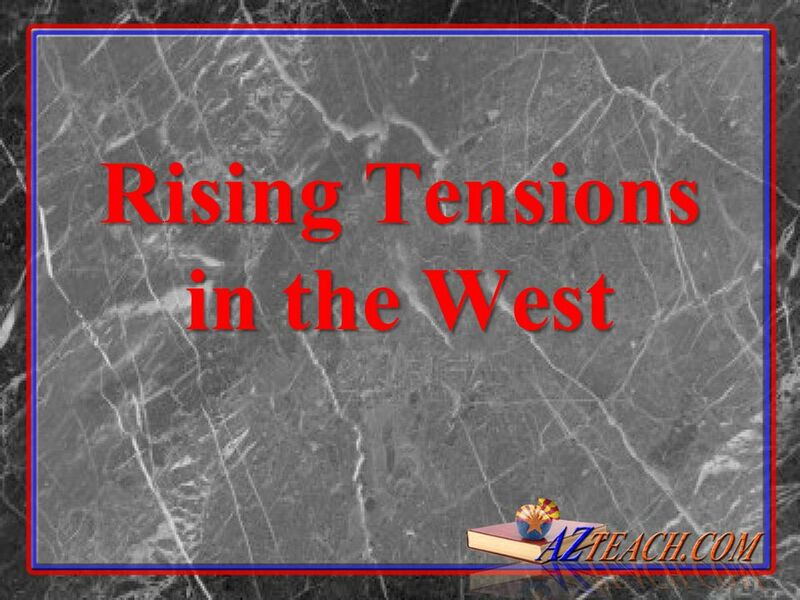 Looking to the West ( ) The Indian Wars. The Great West Native Americans. Native American Struggles The Battle for the West. 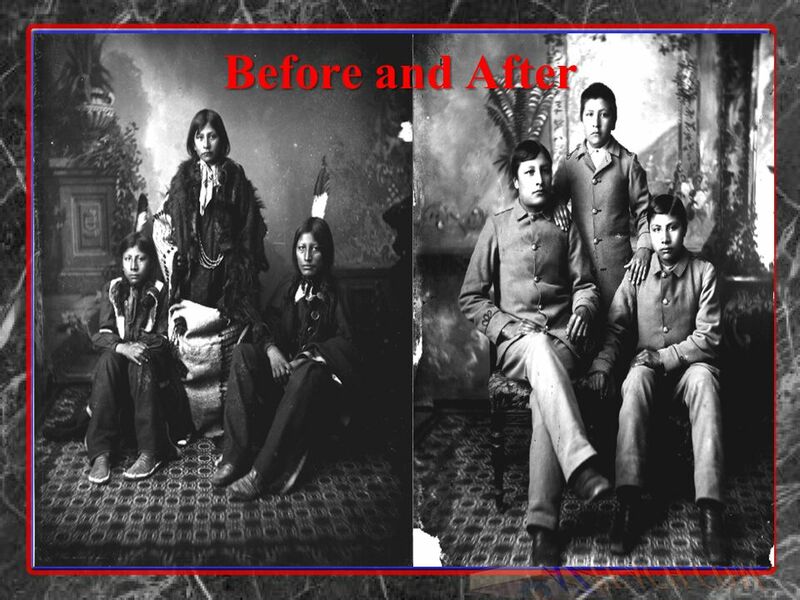 Native Americans Culture and Change. 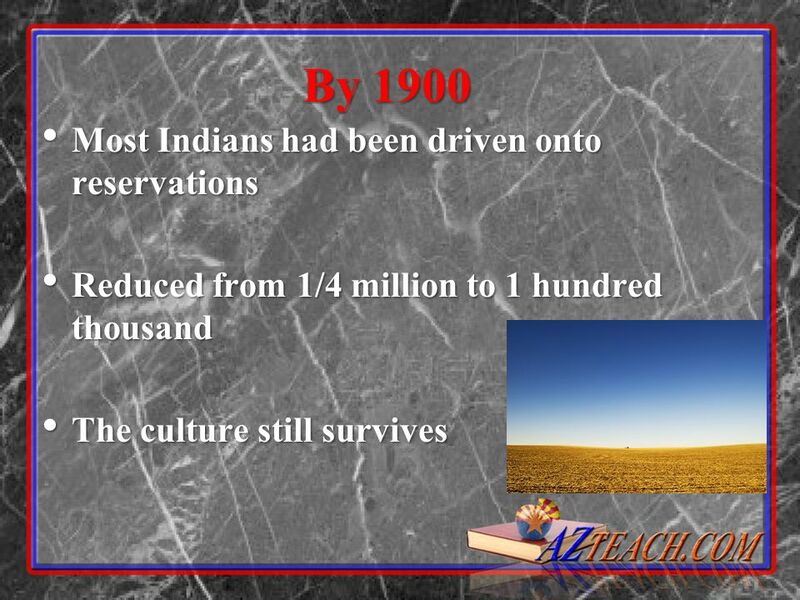 Culture Some Native Americans were farmers, most were nomads following buffalo herds Native Am lived in extended. Think – Pair – Share Assimilation or Annihilation. 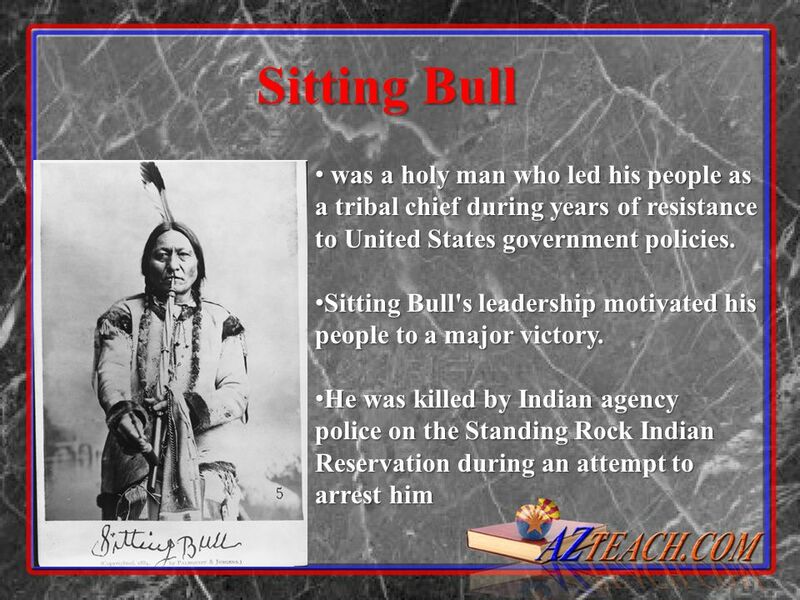 Conflict Between Peoples Native Americans & The United States Government. 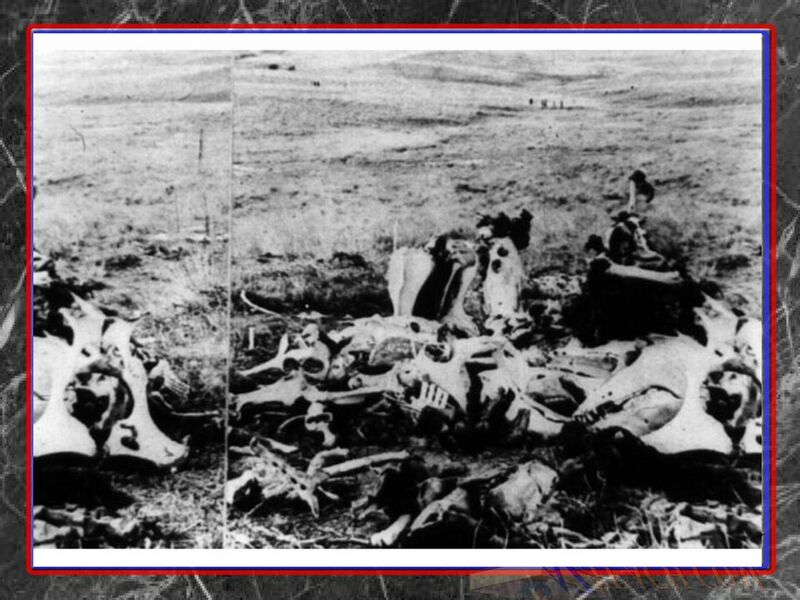 Objectives Describe the importance of the buffalo to the Native Americans of the Plains. 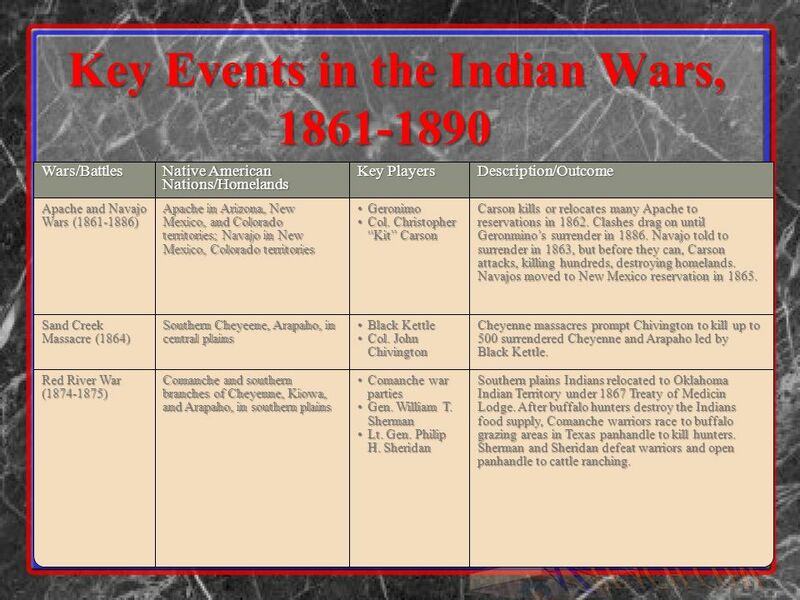 Explain how Native Americans and settlers came into conflict. 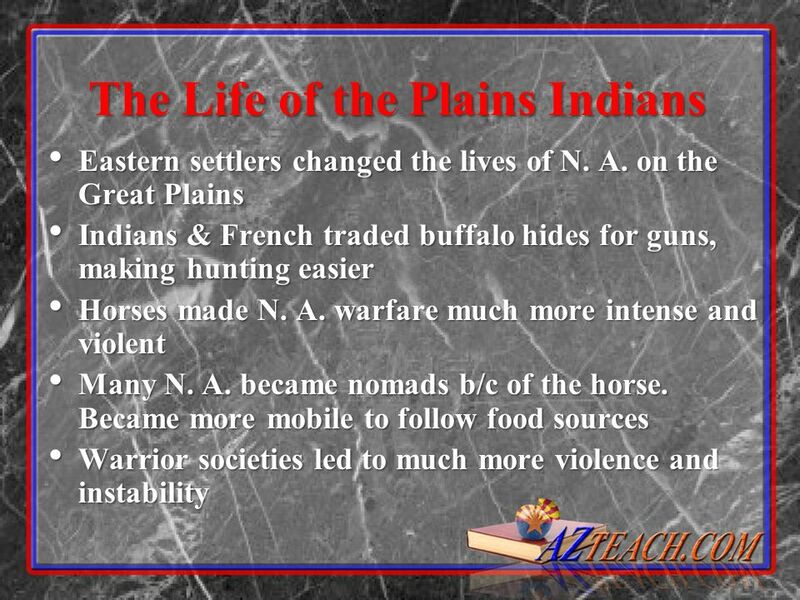 Unit 1 Day 3: Native Americans on the Plains. 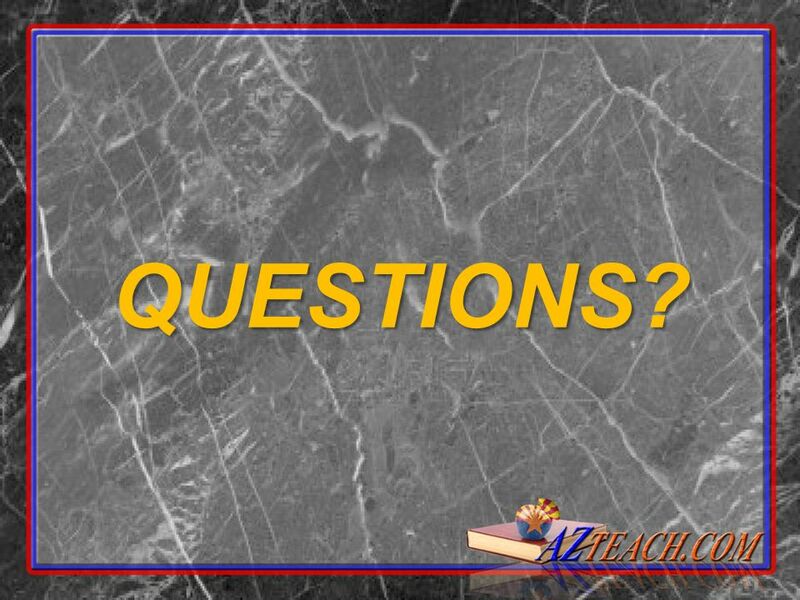 Questions of the Day: 1.How were American Indians pushed to the Great Plains and forced onto reservations?